"Another obscure NES title that deserves a second look...or perhaps a first." Get ready for punching, slapping, poking, pie-in-the-face fun with Moe, Larry, and Curly. Join these legendary loonies as they turn your NES into a classic stooges movie, with you as the star! Ten games-within-a-game, including Stooges trivia. Hear the Stooges' actual voices! Nyuk! Nyuk! Relive a scene from a Stooges movie. Can this zany trio save the orphanage from the clutches of an evil banker? Why soy-ten-ly! Go crackers with Curly as he battles nasty oysters in his chowder (table manners not required).. 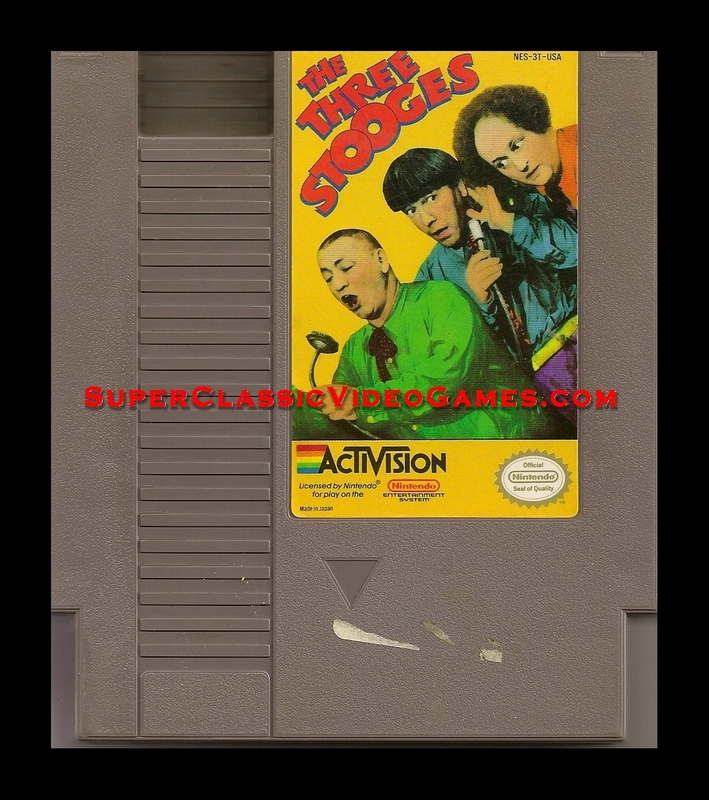 The Three Stooges is a rare game that is well known but should be tried and that is getting much harder to find anymore. I do have a copy on my web site. VERY RARE CARTRIDGE FOR THE NES AND IS MADE BY Beamsoftware/Activision. IT IS AN AWESOME GAME AND IS EXTREMELY HARD TO FIND ANYMORE. I SEE IT NOW AND THEN ON EBAY. I HAVE ALSO LINKED IT TO MY ONLINE STORE. IT IS A GREAT ACTION GAME. TRY IT AND SEE FOR YOURSELF. IF YOU CAN FIND IT SINCE IT IS RARE. WE HAVE FOR SALE MANY RARE NINTENDO NES CARTRIDGES. ARE YOU LOOKING FOR A GREAT RARE NINTENDO NES GAME FOR SALE? CHECK OUT OUR STORE INVENTORY. WE HAVE MANY NINTENDO NES GAMES FOR SALE. MOST OF THEM ARE RARE AND ON SALE. SOME ARE NOT RARE BUT ARE STILL FUN TO PICK UP. WWW.SUPERCLASSICVIDEOGAMES.COM IS AN ONLINE VIDEO GAME STORE THAT HAS MANY RARE ITEMS ON SALE. YOU WILL FIND MANY RARE NINTENDO NES GAMES FOR SALE ON MY SITE. WE NOT ONLY HAVE THE RARE GAMES ON SALE, BUT WE HAVE THE FUN AN COMMON GAMES. IT TRUELY IS A GREAT ONLINE EXPERIENCE. IF YOU ARE INTERESTED IN AN ITEM THEN CHECK OUT MY ONLINE STORE. WE ACCEPT PAYPAL AND HAVE MANY ITEMS IN STOCK. WE HAVE MANY CHEAP VIDEO GAMES FOR SALE. ALL OF THESE ARE USED CLASSIC NINTENDO NES GAMES EXCEPT A FEW. THEY ARE CLASSICS AND WILL PLAY ON YOUR CLASSIC NINTENDO NES CONSOLE.